Go on, be honest. What’s the state of your guest bedroom? 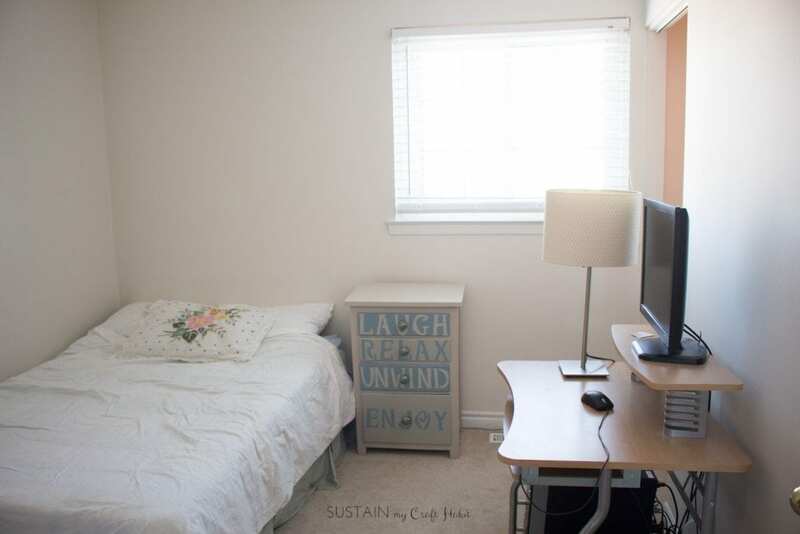 Even if you’re lucky enough to have a bit of extra space in your home dedicated as a guest room, it’s very likely that room has become more of a dumping ground for stuff than a nice guest retreat. A simple spare bedroom refresh has definitely been on my list of things to do but up until now, has seemed daunting and too costly to bother. However, I can now say that I have turned my storage room SLASH computer room SLASH guest bedroom into a room I’m proud to have guests stay in. All of which was done in one weekend, on a budget and very simply [my apologies to all my previous house guests]! And here is my inviting new rustic French Country Guest Bedroom retreat! Did I mention this transformation happened in one weekend? I used pretty much items I already had in my home, were thrifted as well as some furniture pieces (head and foot boards, bunk bed ladder, students chairs) which were passed on from a friend. 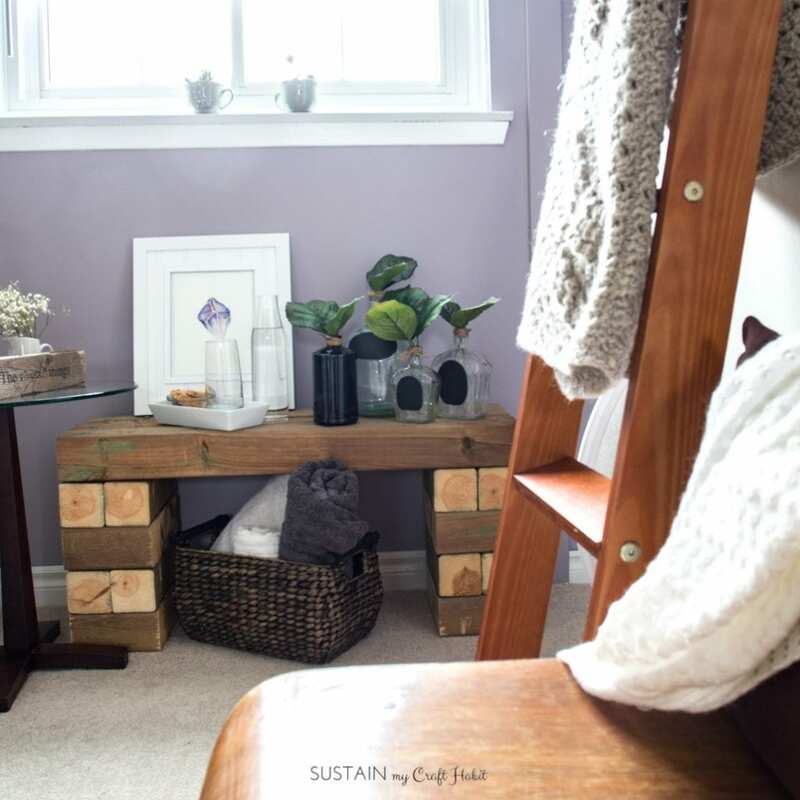 Here are 13 simple and inexpensive ways to freshen up a neglected spare bedroom making your next guests feel welcomed, comfortable and at home. 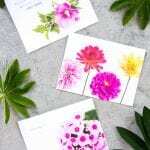 But be warned… these tips may create perma-guests in your home! 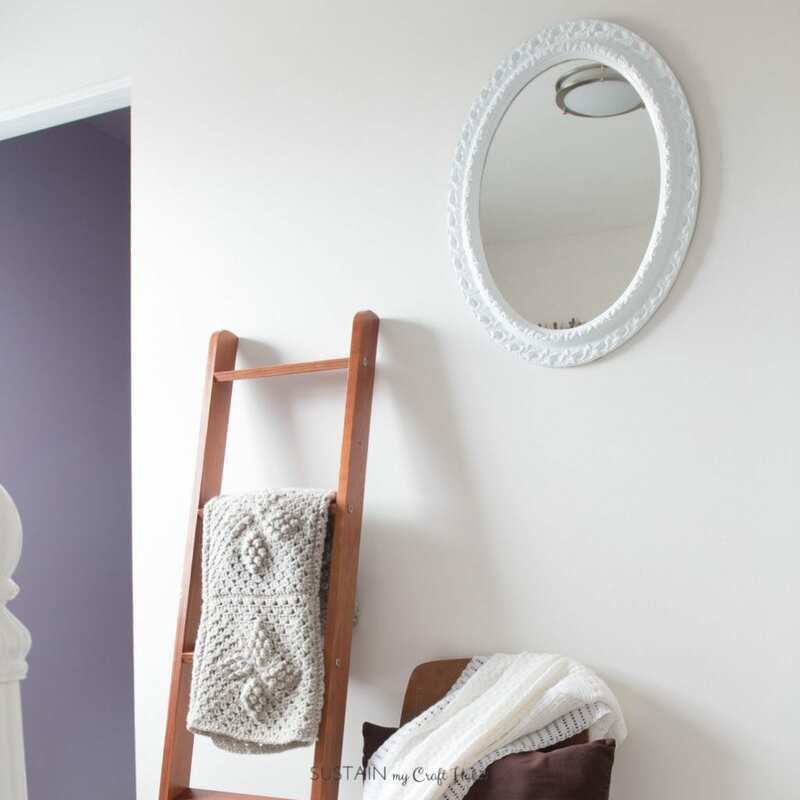 Freshen up the walls with a new paint colour like this beautiful and soft You Look Mauve-lous shade by Home Hardware’s Beauti-Tone brand. 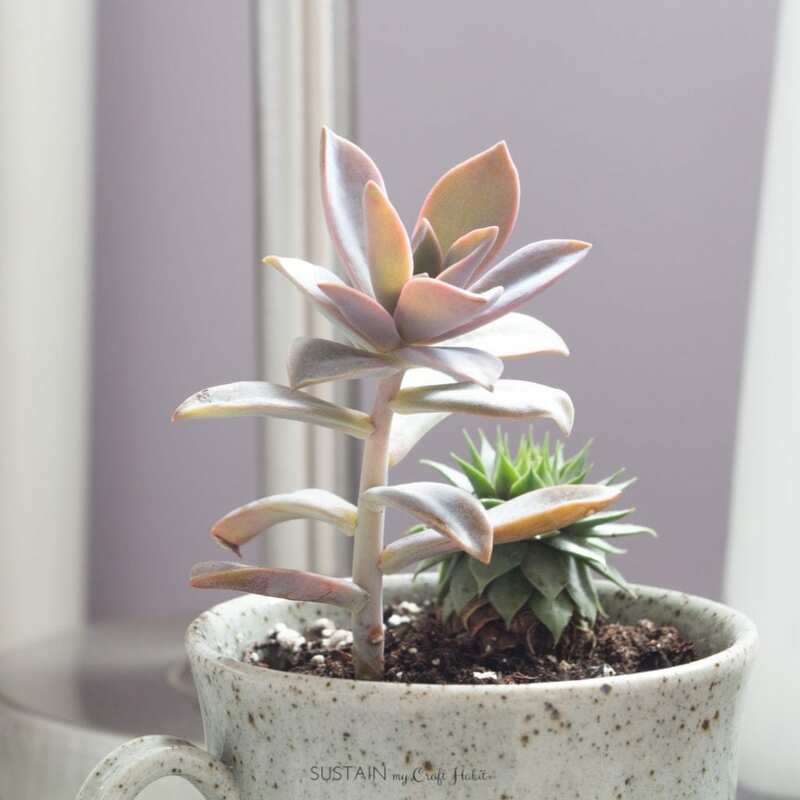 You Look Mauve-lous is Beauti-Tone’s 2017 colour-of-the-year: it’s a gray-infused mauve making it a perfect alternative to the usual neutral tones. Although it pairs nicely with other neutrals like grey and white, we were honestly surprised at how well it also worked with so many other color tones, such as brown, navy and shades of green. Choose affordable neutral coloured and coordinating linens* like you would find in a nice upscale hotel room. [And isn’t that little reclaimed wood sign we found at Home Hardware perfect?]. Make the bed look inviting with cozy pillow shams and throw pillows. You can grab your own succulent throw pillows in our Society6 shop. Leaving out some extra clean bath and face towels* is a nice little touch so that guests don’t need to feel like they’re putting you out by asking for more. 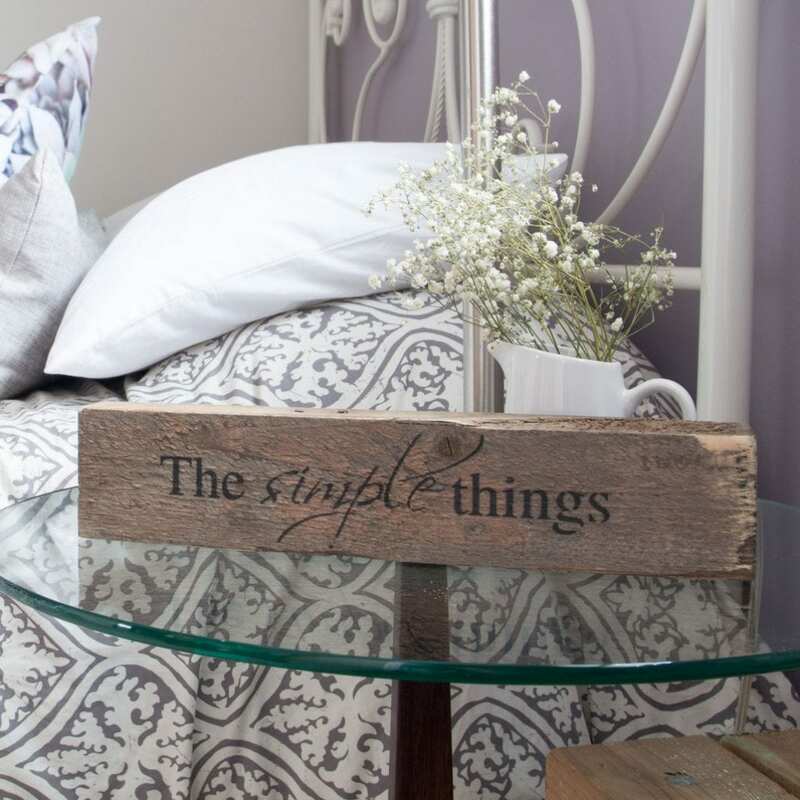 Less is more when it comes to a guest bedroom. It’s great to keep the furniture and accessories to a minimum so that guests can feel like it’s their space, rather than that they’re taking over yours. 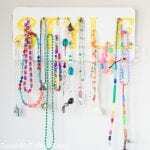 You can find great budget-friendly pieces at a local thrift store or on buy and sell sites. The majority of the bigger furniture pieces in our room (like the head and foot board, retro school chairs and bedside table) are all either thrift store finds or hand me downs. 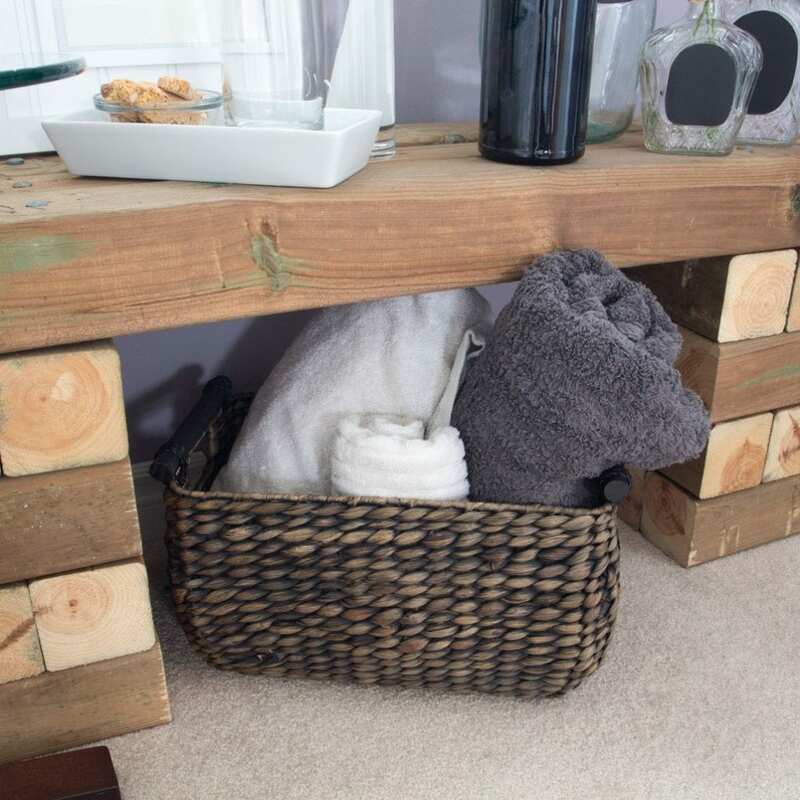 Add a variety of storage solutions, such as baskets and totes, for guests to put their belongs in as well as to hide away any “stuff” of your own that still needs a place to call home. You can easily create your own as well, like we’ve done with our upcycled tissue box and upcycled cardboard box and even our tshirt yarn crochet basket. 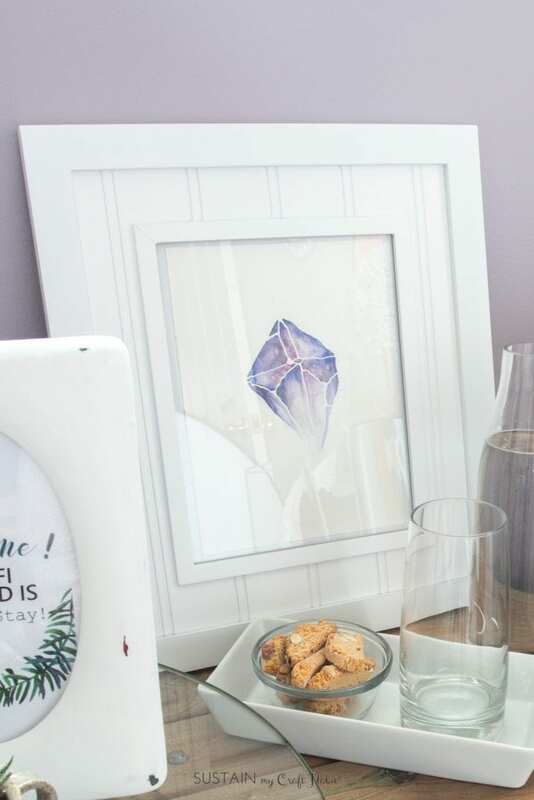 Add some personality by including colourful and fun art pieces. 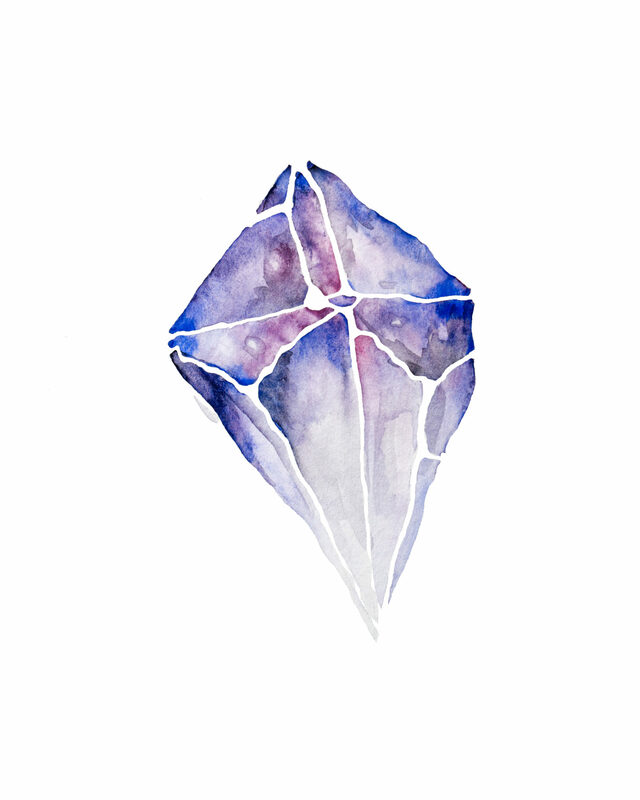 You can find tons of free printables online such as this FREE watercolour amethyst crystal printable which we have for you. 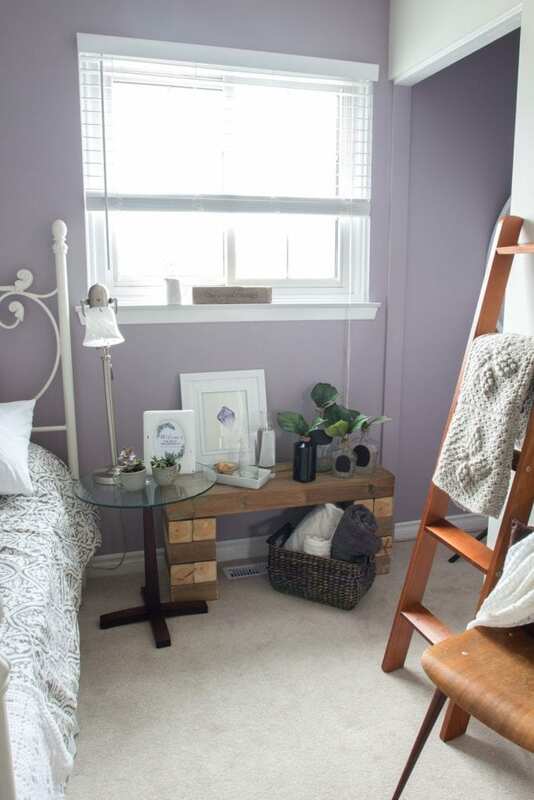 The purple gem really pops next to the You Look Mauve-lous wall colour. 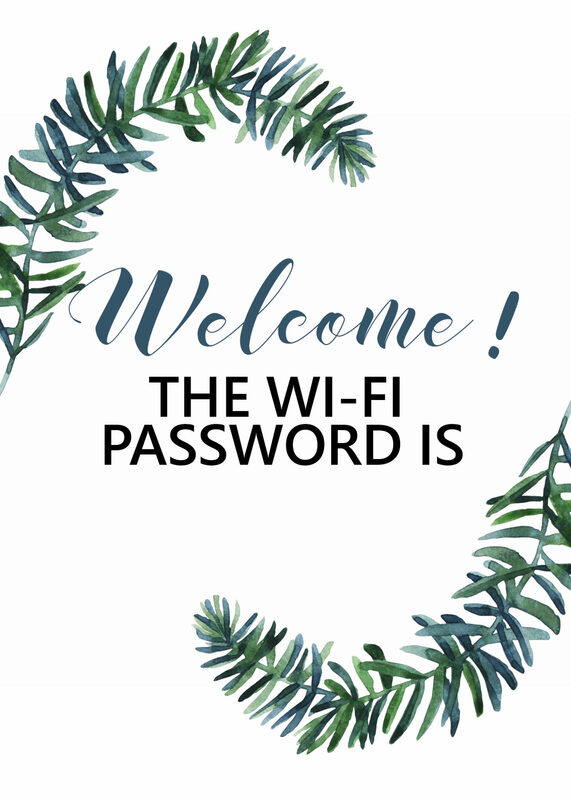 Save yourself the hunt of finding the guest WI-FI password when they ask and just leave a sign for them in the room. 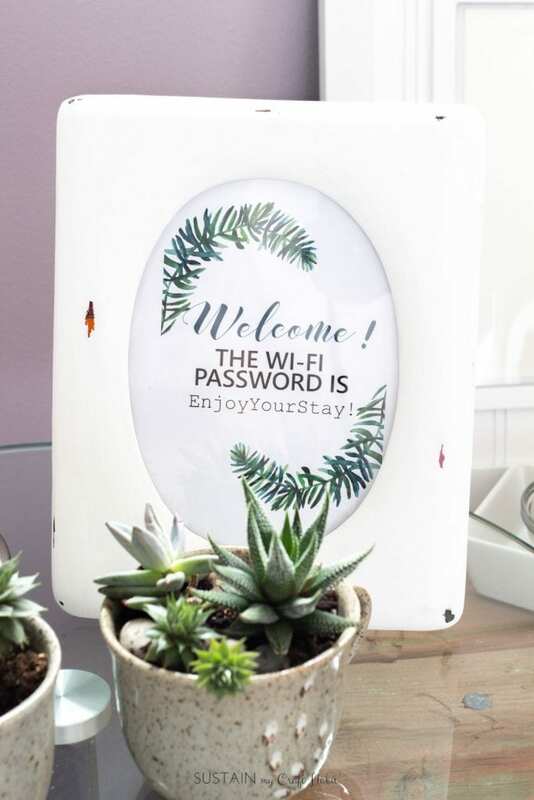 Download a copy of this FREE customizable WIFI sign for your guest room. 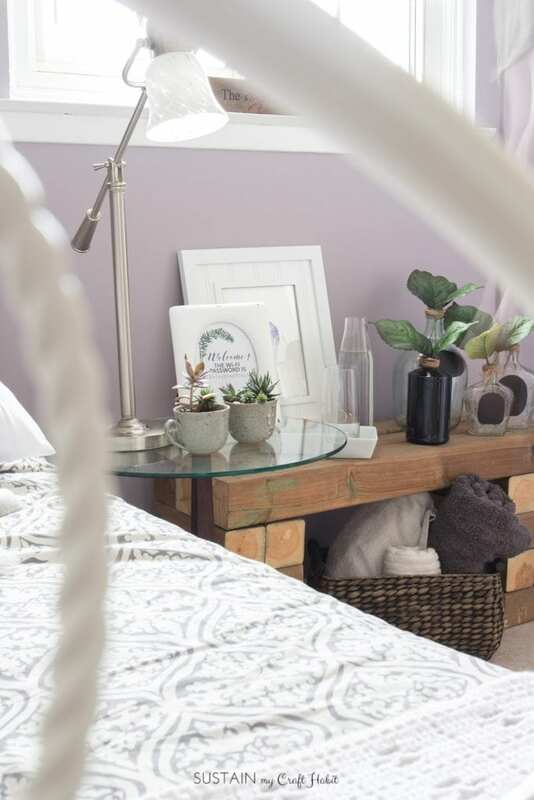 Who doesn’t love flowers and a little greenery in their bedroom? Arrange a vase full of fresh or artificial flowers and greenery beside the bed. 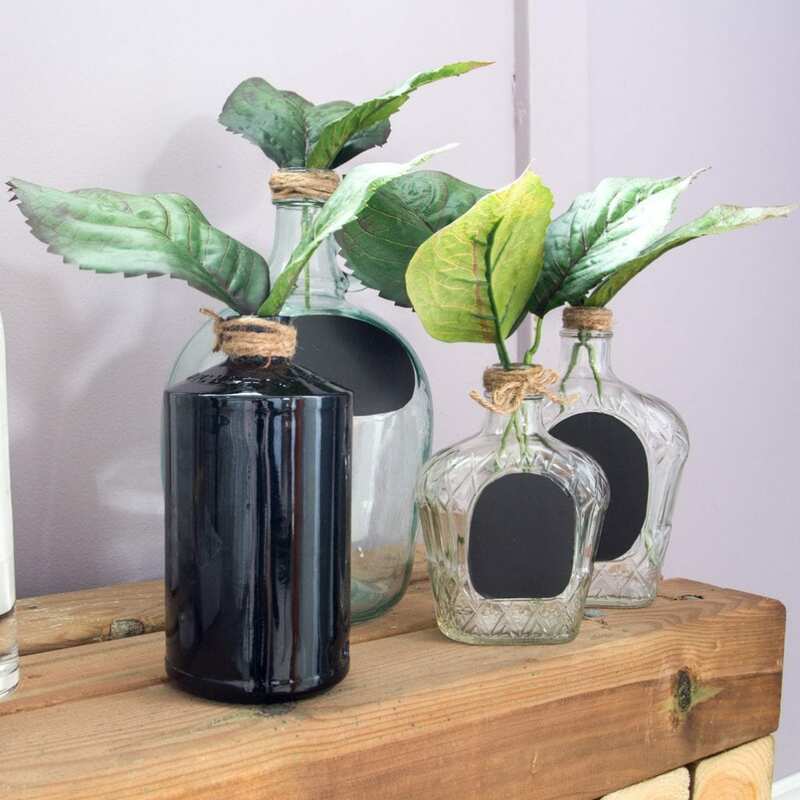 Or upcycle some liquor and wine bottles into a beautiful decorative display. So guests can lament how quickly the time is passing in their French Country retreat. 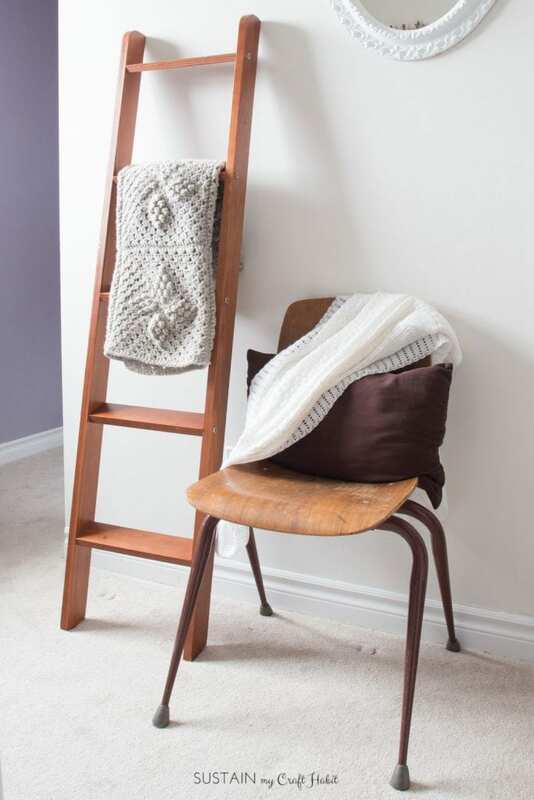 Wouldn’t this vintage-inspired one look great in the room? 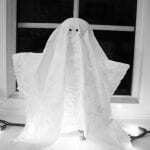 For your guests to use at night or for reading before bed. Alternatively, install a dimmable ceiling light fixture. And lastly….make your guests really feel the love by assembling a small basket of treats such as biscotti and granola and fresh water for late night snacking. 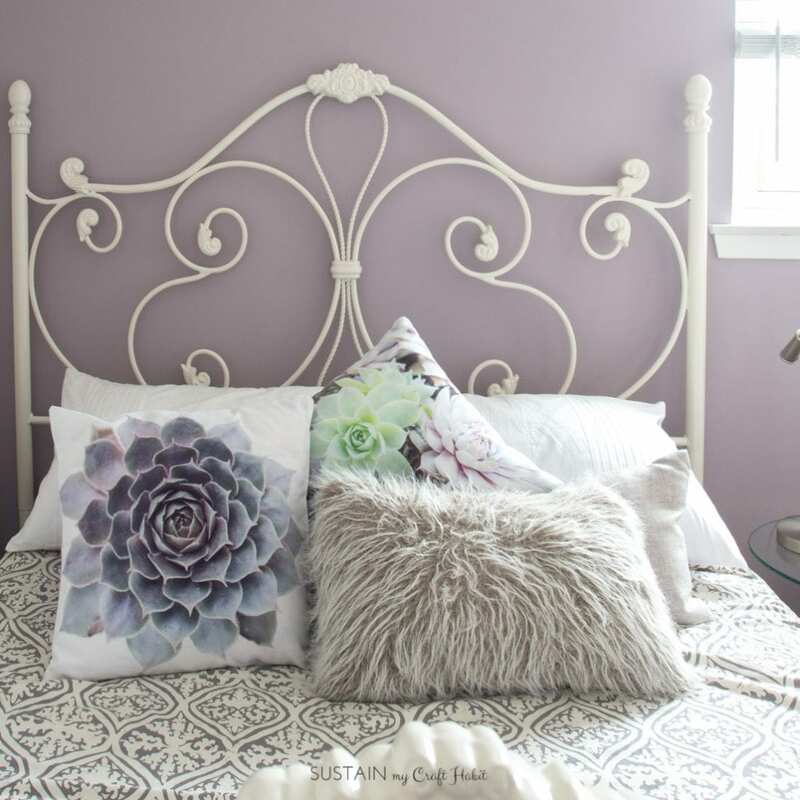 What other mauve-lous guest bedroom ideas do you have to make your guests feel welcomed and at home? It’s SO pretty! 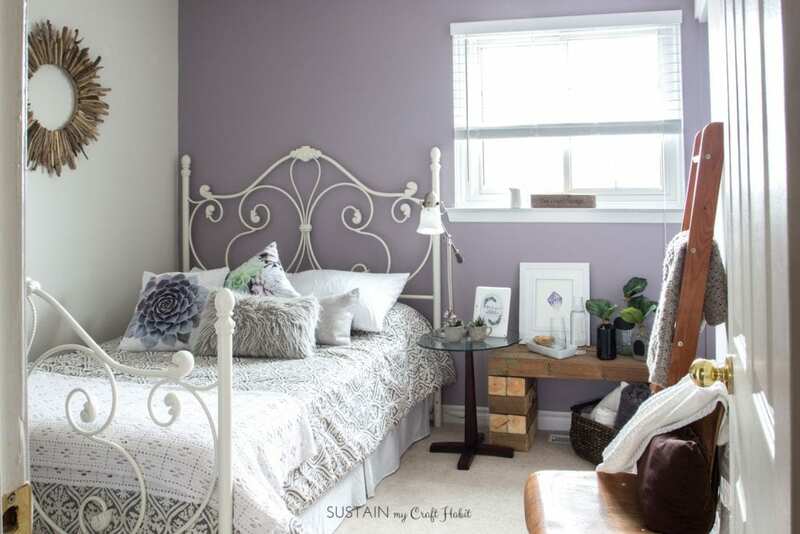 lolving the mauve in this room! Love all your tips too. Looks amazing girls! Great tips! The room looks so relaxing – which is just perfect for guests! Love the log table and the $2 mirror. Is the crochet basket in the room? I don’t see it. I LOVE that accent wall color! The whole room is so refreshing and calming! I love what you did with the room! 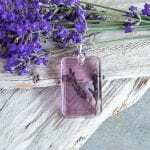 The lavender color is so inviting and cozy too!